Micromax Unite 2 was one of the first devices to get the Lollipop update of all the Microamx devices and after the update some users have complained about some apps not functioning well like Mail, Twitter etc and users are looking for solutions or to downgrade it to Kitkat the earlier version on which it was running on. Here I am going to show you step by step procedure on how you can downgrade to Android Kitkat from Lollipop in your Micromax Unite 2 smartphone. Earlier we had posted the tutorial to update your Micromax Unite 2 to Android Lollipop with the official Lollipop 5.0 ROM, if you have updated your device by Rooting and using a custom Lollipop ROM try and install the custom ROM and see if the same issues are present. Make sure that the device is charged up fully before you start the process. 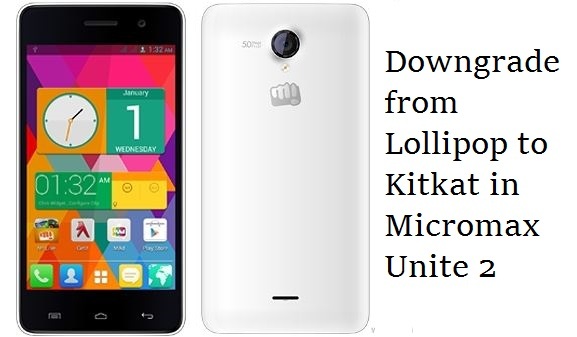 Steps to Downgrade Micromax Unite 2 to Kitkat from Lollipop ? Firstly in your Laptop or PC Download and install the USB drivers if you have not yet installed them yet. Now you have to download and extract both the SP tools and Stock ROM on to your computer. Now open SP tools and you have to run the program as administrator which can be done by Right clicking on the file and choosing it from the menu. Here you have to click on the Scatter loading option and SP tools will ask to choose the scatter file in your Computer or Laptop. From here you have to direct to the extracted Stock ROM file and choose the scatter file from the Stock ROM folder. Go to the drop down menu and choose Firmware Upgrade and turn off your phone and remove battery and connect it to your computer via USB cable. Now you have to click on the download button and SP tools will recognize your phone and the installation process will start. In case your device is not being detected the drivers installation was not successful on your computer and has to be done again (you have to replace the battery before this step). Now you will notice that a Green ring will appear which means you have successfully downgraded from Lollipop and installed Android Kitkat on your Unite 2. You have to Reboot or Restart your device once for the Kitkat installation to be completed. You can now enjoy Android Kitkat without having to face the problems being faced while using Android Lollipop. Do let us know if you have faced any problems in any step during the process. If you have not backed up the data you will be loosing it. how many time Green ring will appear? They are working Joydeep, what issue did you face while using them ?? The flash tool seems to be infected. Can you plz look into it? The Tool has been changed, do try it out now. Facing same problem and would like to know whether programs like Kingsoft etc. will be loaded in KITKAT or we to load all this.